How to use a voice recording as a ringtone? Q: How do you change your voice recording into another profile mode? Thanks for your feedback. I have a little difficulty understanding your question, but I will assume you mean how to assign a voice recording as one of the ringtones in your sound profile. 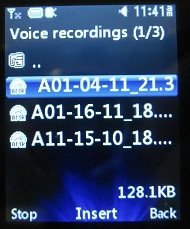 When you make a voice recording, the recordings are stored in a folder and given funny names like: A01-04-11 . . . etc. You may want to make a note of which recording you want to use as a ringtone though it's not really necessary as the voice recordings will play when you go to select them. 1) Go to Settings -> Sound Profiles -> and choose the sound profile that you want to change to add a voice recording as ringtone. Let's assume it's the Normal profile. 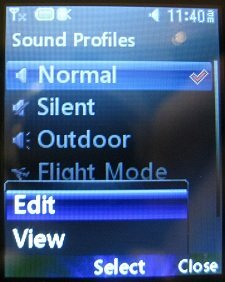 2) Navigate up of down with the center navigation buttons until the Normal profile is highlighted and then select "Options", make sure "Edit" is highlighted and press "Select"
3) Click on the up/down navigation buttons until the ringtone (usually an mp3 or amr file) is highlighted and select "Change" by pressing the center navigation button. 4) You'll see a list of options: Default Sounds, Ringtone, and Voice recordings. Using the navigation buttons, highlight "Voice Recordings" and select "Open" by pressing the center navigation button. 5) As you highlight one of the various voice recordings listed, the recording will start to play. When you find the one you want, select "Insert"
6) Select "Done" to save your changes. Thanks for checking out my site, and I hope this helps. Comments for How to use a voice recording as a ringtone? I've tried to change my message tone to one of my voice recordings, but when I hit "change" it says unsupported file type! Please help! I try making the message tone a voice recording, but it also says "unsupported file type" and there is no option "use as" if i am done recording something. Help, please! I just tried it again by recording a "testing 1 2 3" message on the phone's voice recorder. After I pressed Stop, I clicked on Options -> Use As -> Voice Ringtone and got a "Saved" confirmation. My settings for the voice recording were: Quality: Superfine, Duration: Unlimited (though I assume the recording itself should be short). 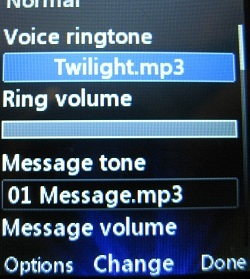 The file was saved as an .amr format which is the usual ringtone format though this phone is also capable of using mp3 ringtones. When I try to change my ringtone to a voice recording I get an unsupported file type error message. Any help with this problem?